ONCHAN, Isle of Man – December 1, 2016 – The European Poker Tour (EPT) Prague festival, sponsored by PokerStars, an Amaya Inc. (Nasdaq: AYA; TSX: AYA) brand, is set to be the biggest live event ever held in Prague. Joining forces with the Eureka Poker Tour, this year’s 12-day Prague poker extravaganza will feature a record 100 tournaments at the Hilton Prague, from December 8-19, 2016. 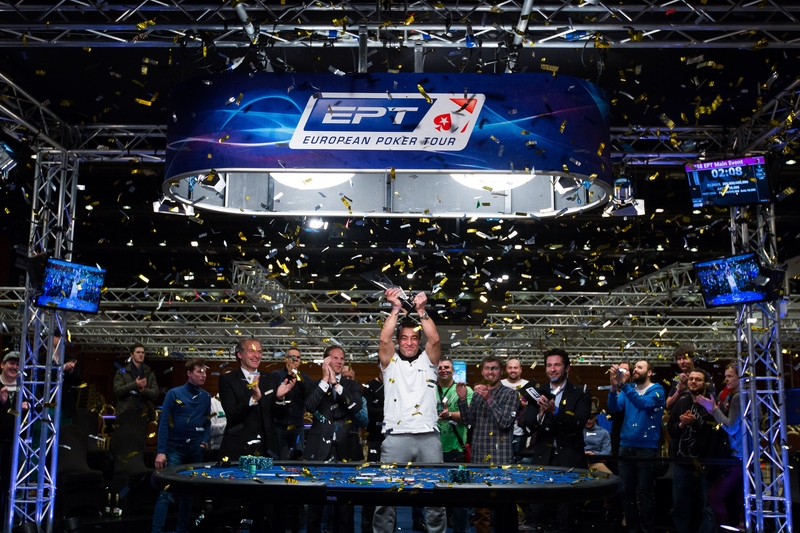 Nearly 350 players have won their way into the €1,100 Eureka Prague Main Event, while more than 160 players have already qualified for the €5,300 EPT Main Event. A wide range of satellites and qualifiers are running daily on PokerStars.com giving players a variety of ways to win their seats into the Main Events. “EPT Prague always attracts a huge number of players, and with a record number of tournaments on the schedule this season’s event is set to be one of the biggest and best live events ever held by the EPT,” said Edgar Stuchly, PokerStars' Director of Live Events. EPT Prague will feature a host of fun, dynamic formats and variants, including a combined chess and poker tournament; a one-day €25,500 High Roller; a High Hand Instant Win Turbo tournament, where at each level the player with the highest hand wins back their €550 buy-in; a €120 Deuces Wild "Quack Quack Half a Rack" tournament, which awards €50 for any player dealt pocket deuces; and the €220 Prague Open. Other highlights during the Prague Poker Festival include a return of the €50,000 Super High Roller, as well as the ever-popular €2,200 Eureka High Roller and €10,300 EPT High Roller events. A number of big name poker players and Team PokerStars Pros are looking to claim this year’s EPT Prague crown from German Hossein Ensan, who won the Main Event for €754,510 last year defeating a field of 1,044 players. Team PokerStars Pros Theo Jorgensen, Fatima Moreira De Melo, Luca Pagano, Vanessa Selbst, Bertrand 'ElkY' Grospellier, Felipe Mojave, Jake Cody, Liv Boeree and Marcin Horecki have confirmed their attendance. One of the highlights of this season’s festival will be the EPT Prague €150 charity tournament on December 13 at 19:30. There are some amazing prizes up for grabs such as a weekend away and dinner for two compliments of EPT Travel, €1,000 tournament credits and various Apple products such-as an Apple Watch and iPad. Right To Play Ambassador Darius Knight, former England 2012 Olympic table tennis ace, will host a table tennis challenge, with a seat to the Right To Play charity tournament for the winner. Knight will be showing off his skills and challenging EPT players on December 13 from 14:30-16:30. A host of Team PokerStars Pros are expected to compete in the re-buy event which will be held in aid of EPT Season 13 charity partner Right To Play, a charity that uses the educational power of sports, games and play to help children and young people overcome the effects of poverty, disease and war. In addition to the packed schedule and EPT-run cash games, there are plenty of activities for those looking for action away from the tables, including seasonal celebrations at the annual EPT Prague party, which will be held in the Hilton’s Cloud 9 sky bar on December 12 from 22:00-02:00. Players and media are also invited to come and share their thoughts and ideas with PokerStars reps at the ‘Ideas Hub’ on December 12-14 from 17:00-19:00. The EPTLive webcast will be streaming for seven days in Prague starting with the €50,000 Super High Roller Final Table on December 13 and the €2,000 Eureka High Roller Final Table on December 14. EPTLive will broadcast much of the action with EPT Main Event coverage beginning on Day 2 (December 15) and continuing throughout, including a cards-up final table on December 19. Hosts James Hartigan, Joe Stapleton and Matt Broughton will be mixing up live commentary and studio guest appearances with quizzes, promotions and much more. The stream will be available in a wide number of languages, on desktop and mobile on PokerStars.tv, Facebook, YouTube and Twitch channels. For the full schedule go to: http://psta.rs/2fMsX1B. Last season, the EPT 12 Prague Poker Festival attracted nearly 16,000 tournament entries with more than €24.5 million awarded in prizes. To watch a short video about EPT Prague, go to: http://psta.rs/2gxf1Hc. If you would like to use this video for your articles and need a particular format, please contact press@pokerstars.com. The full EPT 13 Prague Poker Festival schedule is available online here. The European Poker Tour (EPT) sponsored by PokerStars is the world’s richest and most popular poker tour. Since 2004, the EPT has paid out over €977 million in tournament prize pools and hosted successful festivals across Europe. The EPT also incorporates the PokerStars Caribbean Adventure (PCA), now the PokerStars Championship Bahamas, which takes place every January in The Bahamas, one of the richest poker festivals in the world. The EPT brand is ultimately owned by Amaya Inc. (Nasdaq: AYA; TSX: AYA). Further information on the EPT is available online at http://www.ept.com/.